…Is with your FRIENDS on a SUNNY DAY in a HARBOR with a GIANT BRIDGE. Paddle boarding is what you do on a board with a paddle. How can these statements hold true when they contradict each other? You see, a modern paddle board is simply a flotation device like a long board, that will stay afloat in water, and is fitted with a mat for stability and grip. One uses this board to propel themselves through the water with a paddle. The technical term is Stand Up Paddle board, commonly seen as SUP. There are extreme forms of paddle boarding, paddle board yoga and paddle board fitness, (lessons that draw you through a normal yoga routine, but on a paddle board, great for core strength.) 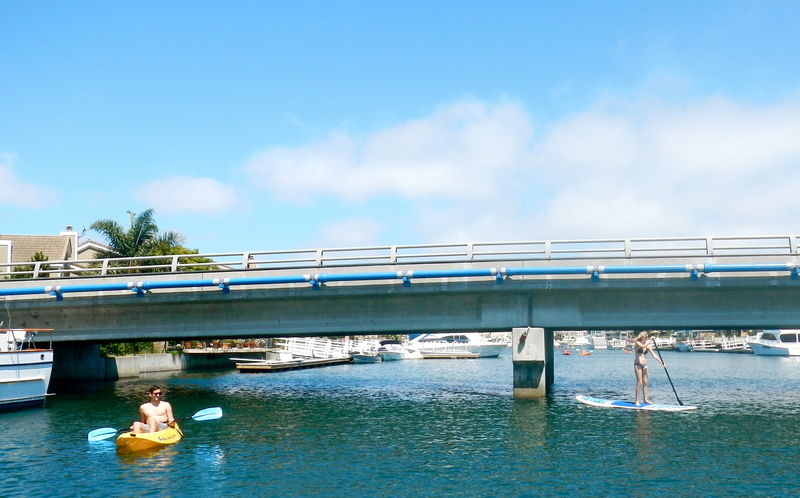 Mainly, however, paddle boarding is a leisurely activity that allows you to enjoy the water and your present company. Easy simple good clean fun. It is potentially a great full body work out. The legs and core are engaged for stability, and the shoulders and arms work together to push the paddles through the water. However, the muscles need only be severely exhorted if the boarder wishes to travel rapidly or if he or she is paddling against a strong current. Therefore, paddle boarding is a work out if you make it one, or a leisure activity if you make it one. The amount of effort you put in is what you get out of it, similar to almost any other activity, as the practices of common knowledge will vouch. Enough of these ridiculous details. All I really have to say is I went paddle boarding this weekend with my best friend Lauren, and her best boyfriend Brad. We rented them from the rental shop by Huntington Harbor, OEXSunsetBeach, $15 for 2 hours. A great deal. But if you do not reside in Huntington Beach, you can check your local google listings for a good deal near you. The sport is becoming rather popular, and a rental facility will probably be closer than you think. All you really need is a paddle, a board, and mellow water. We paddled around Huntington Harbor. They gave us a map, which was convenient for navigating, but our own local knowledge is what guided us towards the tallest bridge. The Trinidad bridge, a great thrill to plunge off of, into the cool oil-kissed harbor water. I was paranoid of smelling like harbor, until I noticed the outdoor shower, then I didn’t care. I have been playing this game for years, and so have all the other kids daring enough to share in the summertime fun. Needless to say, we paddled around, we jumped, we swam, we paddled back. All in all I would do it again. Being on the water in nothing but a paddle board is a very peaceful place to be; admiring the luxurious houses as we cruised past, and chatting about the experience. I’d recommend ending with an ice-cold cup of water, and of course an ice-cold beer. Remember folks, stay hydrated, and don’t drink and drive. And now, some pictures. Thank you for humoring me as you scrolled past my narrative, I know these pics are all you really wanted to see. For more daily updates follow me @itsa_Lisa on twitter, instagram, tumblr, and pinterest. Thanks for checking this out, now get off your computer and go have some fun! It’s summer for crying out loud!